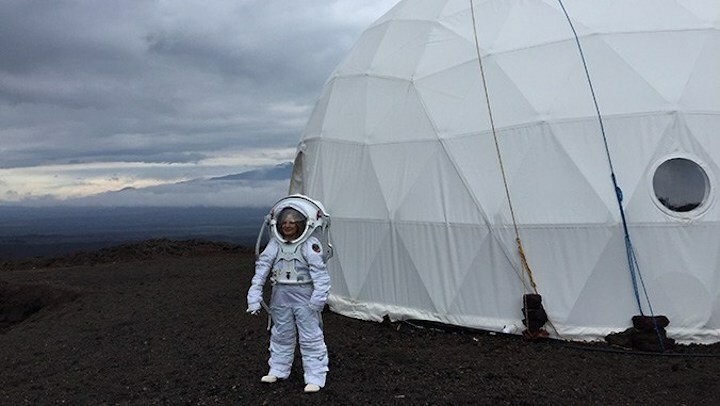 A two-week mission to perform scientific experiments and test technological instruments needed for the future exploration of the Moon or Mars commenced on February 20 at the University of Hawaiʻi at Mānoa’s Hawaiʻi Space Exploration Analog and Simulation (HI-SEAS) habitat on the slopes of Mauna Loa on Hawaiʻi Island. The crew of six is under the command of UH Mānoa’s Michaela Musilova, chief investigator for HI-SEASand the International Moonbase Alliance. The mission is under the EuroMoonMars initiative, led by the International Lunar Exploration Working Group (ILEWG) of the European Space Agency (ESA), in collaboration with the International Moonbase Alliance (IMA), European Space Research and Technology Centre, Vrije Universiteit (VU) Amsterdam and HI-SEAS. It is part of a series of projects led by IMA, which is planning on building a moonbase on the Moon and a prototype moonbase on Hawaiʻi Island. The crew’s research includes geological and drone surveys, lava tube exploration and space technology testing. They will be doing outreach and education, including performing a research experiment designed by high school students in Slovakia who won a Mission to Mars competition last year organized by Musilova. The mission control centre for these missions is based at the Blue Planet Research laboratory on the Big Island, which is owned by the IMA founder Henk Rogers. Bernard Foing of ESA and executive director of ILEWG will be acting as the space-crew communicator at the mission control centre. Interested crew member applicants or for scientific project proposals for future missions, contact Musilova at musilova@moonbasealliance.com. The current mission is scheduled to end on March 6, 2019 at noon. Media interested in covering the crew exit should contact Michaela Musilova, chief investigator, HI-SEAS, musilova@moonbasealliance.com or Lori Teranishi at (808) 536-2729, (808) 729-3433 or lteranishi@iq360inc.com.